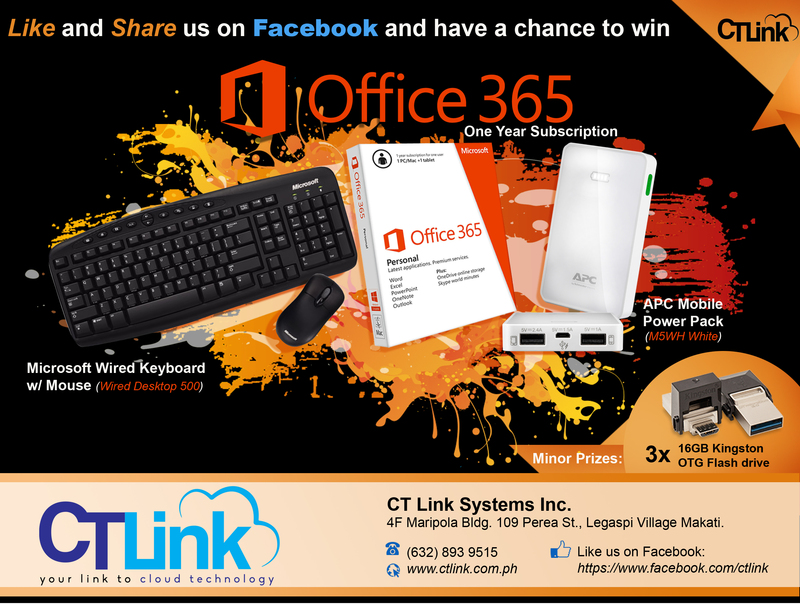 CT Link Facebook Like Raffle Giveaway – CT Link Systems, Inc.
Raffle Giveaway is open to Facebook users residing in the National Capital Region (NCR). To qualify for a raffle entry, simply LIKE the Facebook page of CT Link Systems at https://www.facebook.com/ctlink. To get more chances of winning, SHARE the Facebook Like Raffle Giveaway post on your Timeline and earn 3 extra raffle entries. Raffle draw will be on the 30th of September at 5:00PM. Names of winners will be announced and posted on CT Link Facebook Page. Winners can claim their respective prizes at the office of CT Link Systems, Inc. at 4/F Maripola Building, 109 Perea Street, Legaspi Village, Makati City. Please present a valid government-issued ID. Winners can claim their prizes within 30 days after the announcement of the raffle draw winners, Mondays to Fridays from 8:30am to 5:30pm. Deadline for claiming of prizes will be on October 30, 2016. Prizes not claimed by October 30, 2016 shall be assumed to be forfeited by the winner. No redrawing of unclaimed prizes will be held. All employees of CT Link Systems, Inc. and their relatives up to the second degree will not be eligible to join this Raffle Giveaway. For any inquiries, please contact us at 893-9515. ** All decisions by CT Link Systems, Inc. regarding the Raffle Giveaway are deemed final and non-contestable.